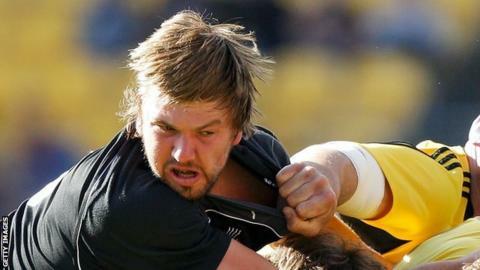 Scarlets' new South African lock David Bulbring says he wants to play international rugby for Wales. The 26-year-old joined the Llanelli-based region on a three-and-a-half year contract on 3 February. "Every player wants to play internationally and I'm here to qualify for Wales," said Bulbring. "It would be an amazing possibility if it happened but obviously for now I just want to focus on doing my job for the Scarlets." Under current regulations, players who have yet to make an international appearance can play for a country after living there for three years. The former Springbok Under-20 international most recently played for the Eastern Province Kings. "I don't think at this stage in my career I'd want to go back to South Africa," he said. "I did have an option to stay there (with Eastern Province Kings), but I wasn't happy with the situation. "I was looking for something else and a bigger challenge." Bulbring, who has also represented Golden Lions, Southern Kings and Blue Bulls, thinks playing in Europe is an increasingly attractive proposition for South Africans. "I think a lot more South Africans will come to Europe - that's my honest opinion," he added. "The exchange rate makes it really valuable for us, the rugby's good, the lifestyle is good, we're well treated and in the UK there's no language barrier. "South African rugby has the money, but because of the exchange rate they'll only be able to keep the top 20 players or so. "They'll pay them what they can get overseas and after that there'll be a divide with some guys wanting to stay to play for the Boks and guys who'll leave." Bulbring says European rugby, especially, suits big, physical South African forwards. "It's not as rewarding for the backs because it's obviously a forward-dominated game," said Bulbring. "It suits the forwards to hang around here longer, it's our game. A lot of backs will want to move off to Japan and play a quicker game."